The unique ability of X-rays for elemental and chemicallyspecific imaging of thick samples at the nanoscale have spurred the development of X-ray free-electron laser sources, as well as ultrafast high harmonic (HHG) X-rays, from tabletop-scale femtosecond lasers. The unprecedented femtosecond-to-attosecond pulse duration and full spatial coherence of the HHG light make it possible to capture the motions of electrons, atoms, and molecules in real time, to observe element-specific dynamics at the M-shell absorption edges of magnetic materials, to understand heat flow in nanostructures, and to implement table-top microscopes with record spatial resolutions of 20 nm. However, to date, most applications that use HHG light have been limited to the extreme ultraviolet (EUV) region of the spectrum, ~50 – 100 eV. Extending HHG to photon energies into the keV region would open up a host of important applications in probing thicker samples (since matter is more transparent at higher photon energies), capturing dynamics at the L-edges of magnetic materials, and imaging dynamics with nanometer-scale spatial resolution. 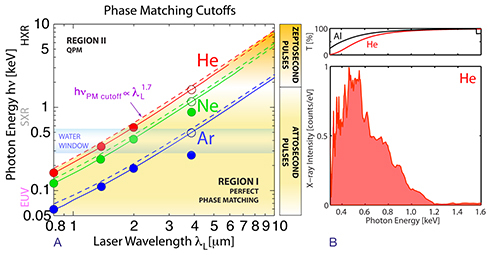 The grand challenge for extending bright HHG to higher energies is the development of phase matching techniques that enable efficient nonlinear upconversion. In previous research using mid-infrared lasers at wavelengths up to 2 μm to drive HHG, full phase matching was demonstrated in the water window up to photon energies of 0.52 keV [1-4]. Essentially, the macroscopic full phase matching cutoff energy scales almost as strongly with the wavelength of the driving laser, hνPM cutoff α λL(1.5-1.7), as with the microscopic singleatom cutoff, hνSA cutoff α λL2. The research group demonstrated bright coherent HHG X-rays at photon energies >1.6 keV (<7.8 Å), promising to realize a coherent ultrafast implementation of the Roentgen X-ray tube in a tabletop-scale apparatus. Full phase matching of HHG in the keV region of the spectrum (> 5031th order) is possible for the first time by using driving laser wavelengths around 3.9 μm. In addition, it generates the broadest coherent supercontinuum to date of >1.3 keV, from any light source, large or small scale. In this experiment, 6-cycle FWHM, 3.9 μm, 20 Hz, multi-mJ pulses are generated as the idler from a novel optical parametric chirpedpulse amplification (OPCPA) architecture. The front end of the OPCPA is based on a femtosecond Yb:CaF2 chirped pulse amplifier that drives a cascaded femtosecond OPA. The subsequent KTA stages of the OPCPA are pumped by a 20 Hz picosecond Nd:YAG laser system and produce uncompressed 30 mJ and compressed 8.5 mJ energy in the signal and the idler beams at 1.46 μm and 3.9 μm, respectively - the highest pulse energy from a femtosecond mid-IR source to date. HHG X-rays are generated by guiding the ultrafast laser beams in a hollow waveguide designed to hold multi-atm phase-matching pressure gases. A custom-made grating spectrometer is used for spectral analysis of generated radiation. X-ray HHG spectra are acquired using the highly-sensitive X-ray CCD camera Newton DO920N-BN, (Andor Technology), cooled down to -50 °C to minimize noise. Using 3.9 μm pulses and 35 atm of He as a nonlinear medium, Fig. 1 shows that the phase matched emission extends to >1.6 keV (<7.8 Å), representing an extreme for coherent frequency upconversion - up to order > 5031th. Fig. 2A shows that the HHG X-ray signal grows quadratically with pressure, even in very dense gas media (with low ionization levels of 0.03%). An approximate brightness corresponding to 108 photons/sec at 1 kHz is observed in a fractional bandwidth of 1% at 1 keV, which is 4 to 5 orders of magnitude greater than reported using 0.8 μm drivers. Full phase matching in Ar, molecular N2, and Ne are restricted by absorption at their L- and K-shell absorption edges of 0.254 keV, 0.41 keV and 0.87 keV (see Fig. 2C). The observed HHG emission from N2 is the highest observed from any molecule to date and has potential for tomographic orbital reconstruction. Finally, to illustrate also the wide breadth of the element-specificity of the keV supercontinuum from this tabletop coherent source, L absorption edges of metals were recorded, including magnetic materials, through the soft X-region, as shown in Fig.2B. Fig. 1. A. Predicted HHG full phase matching cutoffs as a function of the driving laser wavelength, below which bright HHG emission is possible. This generalized phase matching picture is here validated to above 1 keV. Solid circles represent current experimental results and open circles represent the theoretically expected phase matching limits. As predicted , X-rays from Ar and Ne cannot reach the phase matching cutoffs due to L (0.254 keV) and K (0.870 keV) shell absorptions. The absence of inner shell absorption in He allows for the generation of keV X-rays. B. Fully phase matched X-ray supercontinuum to >1.6 keV or 7.8 Å (note linear X-ray intensity scale) with bandwidth >1.3 keV (tail to tail). Fig. 2 A. The experimental X-ray signal at 1 keV grows quadratically with pressure showing excellent coherent buildup in dense, 40 atm, gas pressures where the rescattering electron can encounter neutral atoms and ions. Fig. 2 B. Measured L-absorption edges of metals, including magnetic materials, throughout the soft X-ray region, demonstrating a useful probe for femtosecond-to-attosecond element-selective spectroscopies. Fig. 2 C. X-ray emission from Ar and N2 (similar ionization potentials), and Ne. The predicted phase matching cutoffs hνPM (dashed vertical lines) cannot be reached due to reabsorption of the generated X-rays at the L- and K-shell absorption edges (0.254 keV - Ar, 0.41 keV - N2, 0.87 keV - Ne). The 0.41 keV phase-matched X-rays from N2 in the water window represents the highest HHG photon energy obtained from molecules to date. In summary, this study has demonstrated fully phase-matched X-ray generation in the kiloelectronvolt photon energy region (sub-1 nm wavelengths) for the first time. At 1 kHz, the photon flux that would correspond to ~108 photons / sec in a fractional bandwidth of Δλ/λ ≈ 1% at 1 keV, which is sufficient to enable static and ultrafast bioand nano-imaging in the water window and beyond, and elementselective magnetic imaging at 0.7–0.9 keV. T. Popmintchev et al., Opt. Lett. 33, 2128 (2008). T. Popmintchev et al., PNAS 106, 10516 (2009). M.C. Chen et al., Phys. Rev. Lett. 105, 173901 (2010). T. Popmintchev et al., Nature Photonics 4, 822-832 (2010).